LEN - www.lankaenews.com | 3 hours grilling of Gota for second time on Noyahr’s abduction and torture : Fonseka too to be questioned ! 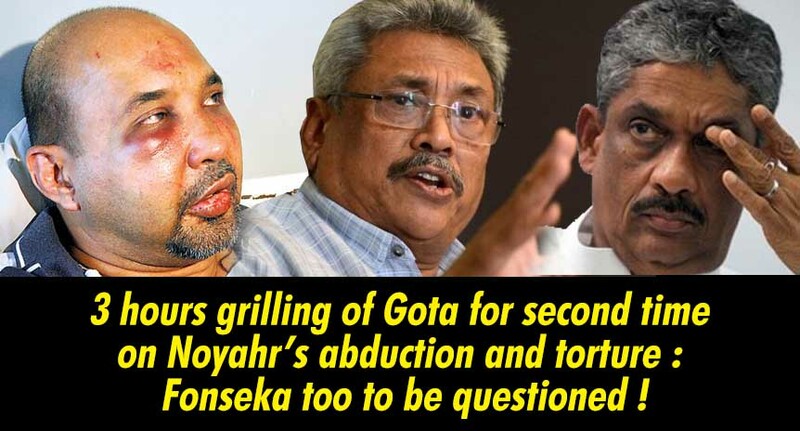 3 hours grilling of Gota for second time on Noyahr’s abduction and torture : Fonseka too to be questioned ! (Lanka e News - 13.Sep.2018, 9.20PM) Former defense secretary Gotabaya Rajapakse was summoned to the CID yesterday (12) for questioning in connection with the abduction ,assault and inflicting most cruel torture on journalist Keith Noyahr. Incidentally this is the second time Gota has been interrogated in respect of this crime. Gotabaya who arrived at the CID at 10.00 a.m. was grilled for over 3 hours. Gota was summoned to the CID yesterday to question him again following the information elicited from the retired major general Amal Karunasekera who was in charge of the army intelligence services then , and the answer collected from Noyahr in Australia when the CID team went there . During that era of the incident , Noyahr in his articles , targeted his criticisms mostly against Sarath Fonseka who was the army commander then and not Rajapakses. Owing to that the accusing fingers pointed at Fonseka . During the period of Lasantha’s murder and brutal assault on Noyahr , Fonseka was with the Rajapakses eating from the same plate. At that time a bigwig of the army speaking to Lanka e News said , if a paramilitary army team is in operation when the war was dangerously raging , that cannot exist only with the knowledge of the defense secretary and the army commander not knowing.. In any event the media reported after the interrogation of Gota , Fonseka is to be questioned by the CID . Speaker Karu Jayasuriya was also questioned on Noyahr’s incident . This was because when Jayasuriya heard of the incident at that time ,he informed of it to Mahinda Rajapakse the president then , which led to the release of Noyahr subsequently. The CID recently questioned Mahinda Rajapakse too over that , when Mahinda said he remembers nothing.